Folliculitis is inflammation or infection of one or more hair follicles (openings in the skin that enclose hair). Folliculitis can affect both women and men at any age. It can develop on any part of the body, but is most likely to occur on the scalp, face, or parts of the arms, armpits, or legs not usually covered by clothing. Small, yellowish-white blister-like lumps (pustules) surrounded by narrow red rings are usually present with both bacterial folliculitis and fungal folliculitis. Hair can grow through or alongside of the pustules, which sometimes ooze blood-stained pus. Folliculitis can cause boils and, in rare instances, serious skin infections. Bacteria from folliculitis can enter the blood stream and travel to other parts of the body. Folliculitis develops when bacteria, such as Staphylococcus, or a fungus enters the body through a cut, scrape, surgical incision, or other break in the skin near a hair follicle. Scratching the affected area can trap fungus or bacteria under the fingernails and spread the infection to hair follicles on other parts of the body. The bacteria that cause folliculitis are contagious. A person who has folliculitis can infect others who live in the same household. Diagnosis is based on the patient's medical history and observations. Laboratory analysis of the substance drained from a pustule can be used to distinguish bacterial folliculitis from fungal folliculitis. Bacterial folliculitis may disappear without treatment, but is likely to recur. Non-prescription topical antibiotics like Bacitracin, Mycitracin, or Neomycin, gently rubbed on to affected areas three or four times a day, can clear up a small number of bacterial folliculitis pustules. Oral antibiotics such as erythromycin (Erythocin) may be prescribed if the infection is widespread. The drug griseofulvin (Fulvicin) and topical antifungal medications are used to treat fungal folliculitis. Eating a balanced diet, including protein, complex carbohydrates, healthy fats, fresh fruits and vegetables, and drinking eight to 10 glasses of water a day may stimulate the body's immune system and shorten the course of the infection. Garlic (Allium sativum) and goldenseal (Hydrastis canadensis), both antiseptic agents against staph infections, may be taken. The daily dosage would vary from person to person and is based on the severity of the infection. Echinacea (Echinacea spp.) is helpful in modulating immune function. Again, the dosage would vary. Daily doses of 30-50 mg zinc and 1,000-5,000 mg Vitamin C (taken in equal amounts at several times during the day), and 300-2,000 mg bioflavinoids can also strengthen the body's infection-fighting ability. High doses of vitamins and minerals should not be used without a doctor's approval. If properly treated, the symptoms of bacterial folliculitis generally disappear in about two weeks. Fungal folliculitis should clear up within six weeks. But it can worsen if the condition is misdiagnosed and inappropriately treated with steroid creams. Anyone who has a tendency to develop folliculitis should cleanse the skin with antibacterial soap twice a day and before shaving and should not use oily skin lotions. Men should not shave while the beard area is infected. When they begin shaving again, they should use a new blade each time. Women who have had fungal folliculitis should use depilatory creams instead of razors. Daily shampooing can help prevent folliculitis in the scalp. The spread of infection can be prevented by not sharing towels or washcloths. "Folliculitis." Thrive Online. April 5, 1998. http://thriveonline.oxygen.com. inflammation of a follicle(s); used ordinarily in reference to hair follicles, but sometimes in relation to follicles of other kinds. gram-negative folliculitis a superinfection complicating long-term systemic antibiotic treatment of acne vulgaris, particularly tetracyclines, usually caused by species of Enterobacter, Klebsiella, or Proteus. keloid folliculitis infection of hair follicles of the back of the neck and scalp, occurring chiefly in men, producing large, irregular keloid plaques and scarring. An inflammation of a hair follicle; the lesion may be a papule or pustule. /fol·lic·u·li·tis/ (fah-lik″u-li´tis) inflammation of a follicle. folliculitis decal´vans suppurative folliculitis leading to scarring, with permanent hair loss on the involved area. keloidal folliculitis , folliculitis keloida´lis acne keloid. folliculitis ulerythemato´sa reticula´ta a condition in which numerous, closely crowded, small atrophic areas separated by narrow ridges appear on the face, the affected area being erythematous and the skin stretched and hard. folliculitis variolifor´mis see under acne. Inflammation of a follicle, especially of a hair follicle. inflammation of hair follicles, caused by an infection, such as in sycosis barbae. 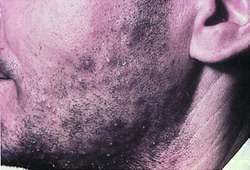 An inflammatory reaction in hair follicles; the lesions may be papules or pustules. Inflammation of hair FOLLICLES causing multiple small boils or pimples. The inflammation usually results from STAPHYLOCOCCAL INFECTIONS. a feature of hypersensitivity reactions in the skin. inflammation of the wall of the hair follicle. usually nonpruritic, papular, crusted lesions with alopecia on the head, neck and trunk. The cause is unknown. In dogs, lesions occur mainly on the ears. In horses and cats, it is believed to be a hypersensitivity reaction to insect bites or other allergens. Q. How can folliculitis be treated? * Use a hot tub, whirlpool, or swimming pool that is not properly treated with chlorine. * Use antibiotics or steroid cream for long periods. * Use or work with substances that can irritate or block the follicles. Examples include makeup, cocoa butter, motor oil, tar, and creosote. * Have an infected cut, scrape, or surgical incision. The bacteria or fungi can spread to nearby hair follicles. * Have a disease such as diabetes or HIV that lowers your ability to fight infection.